It takes gobs of resources to do Epic Journeys. There are so many ways to support our efforts. ​Please consider checking out the options and opportunities below. ​Click here to go to Amazon via our link. YouTube.com - The more folks that subscribe, watch, like, and comment on our videos, the more Google will consider sending a few pesos our way. Click here to visit our Patreon Page. Snazzy Decals - You get a snazzy 3.38" x 2" "Good Motorcycle Morning" decal shipped right to your door and we glean about 73 cents of glorious support from your purchase. ​Click here to check out the decal. Fast Lane Biker Delmarva Magazine - If you'd like to advertise in the magazine, Contact us. I will get you in touch with the right people, and the magazine will hopefully send some support our way. 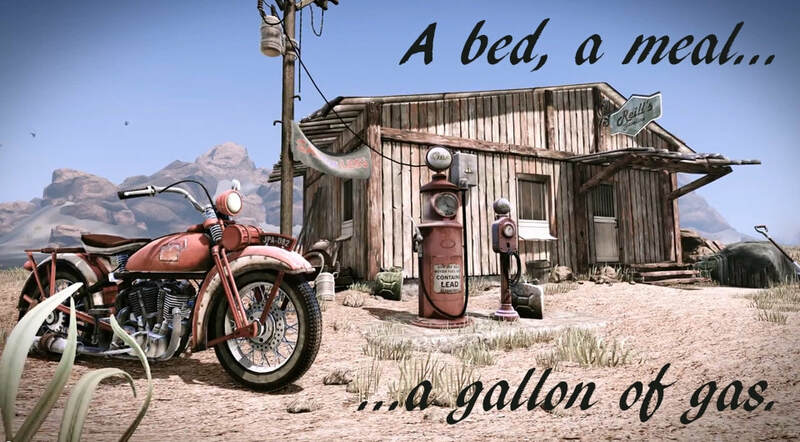 A meal, a bed, or even a gallon of gas! Sponsorship - The next big journey will always be bigger than the last. Do you have gear, lodging, transportation, software, sustenance, or even just a logo that you would like featured on the next journey? ​Click here to sponsor our next Journey.